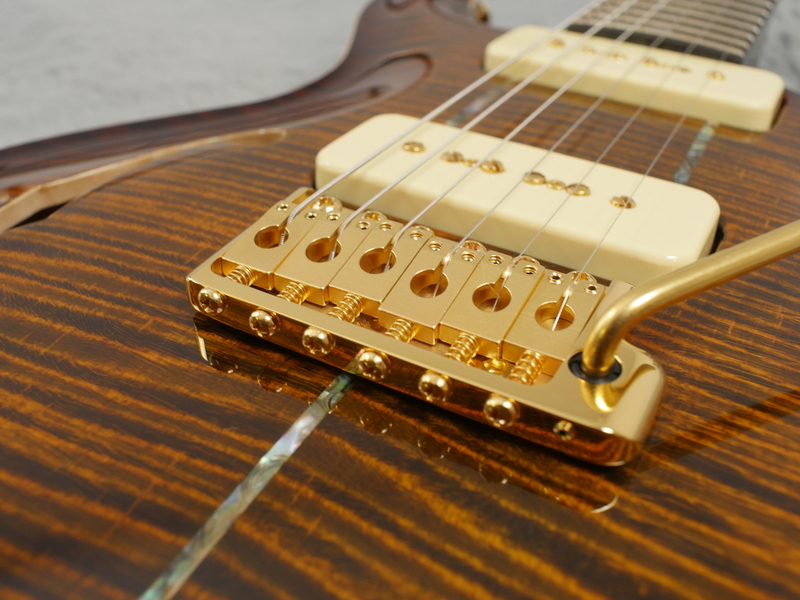 Raising the bar for guitar builders since the mid 80s, Paul Reed Smith Guitars define the high-end guitar market. 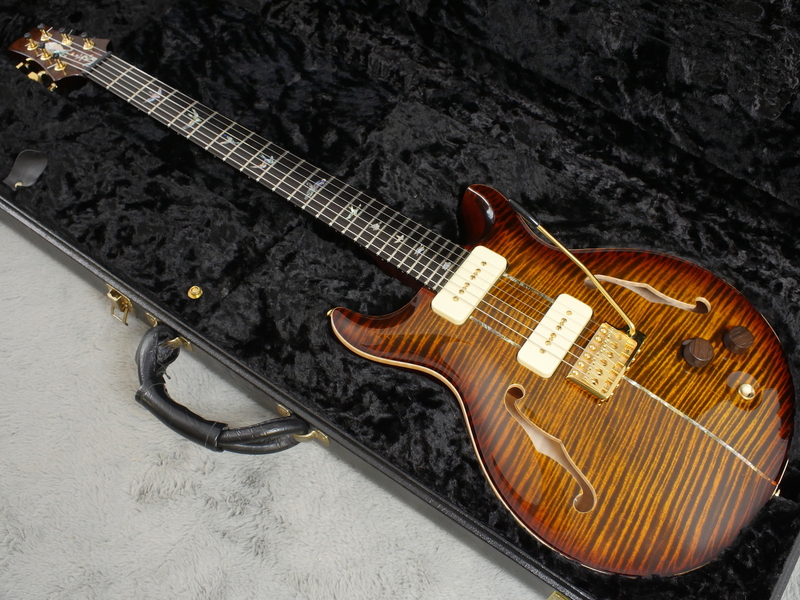 Here is a 2005 PRS Santana II Semi-hollow built for PRS employee Alan Gelston to mark his 7th anniversary at the company. 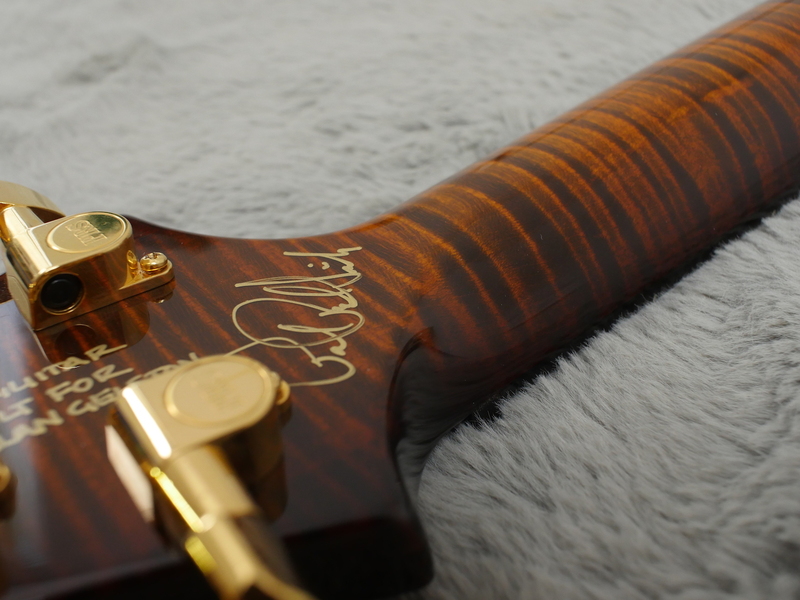 As you can see from the photos, this guitar is stunning. 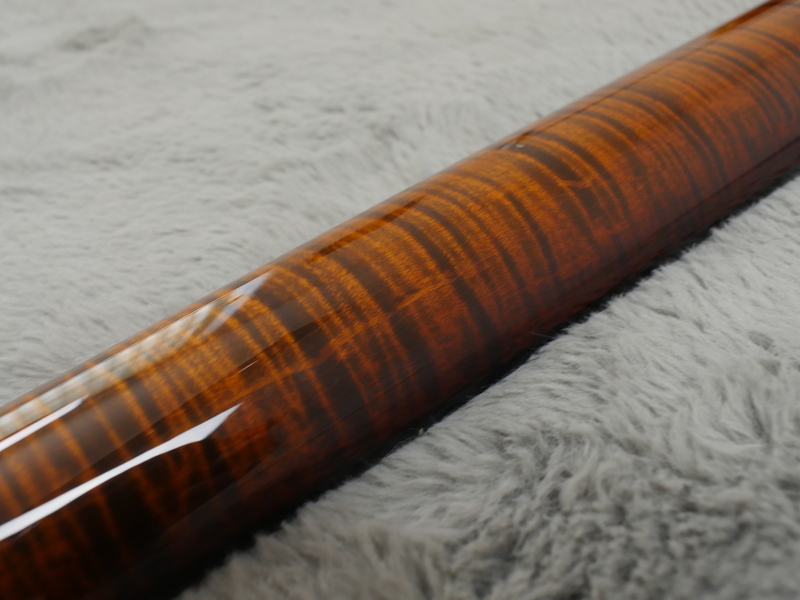 The body is a sandwich of AAAA+ Flame Maple with South American Mahogany in the middle, kiln baked for resonance. 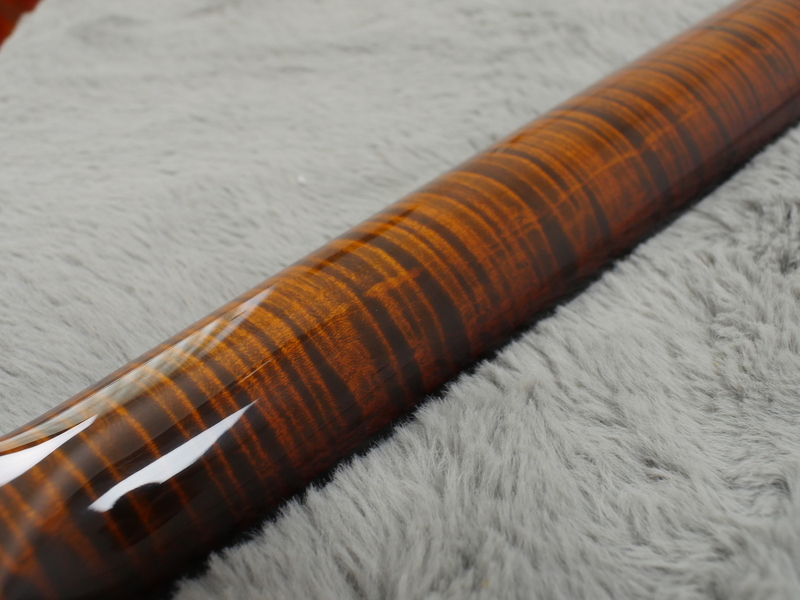 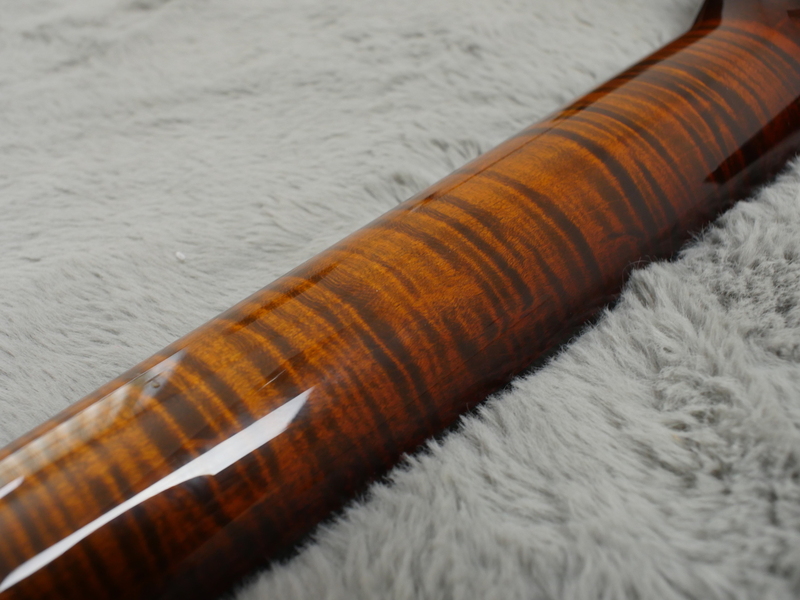 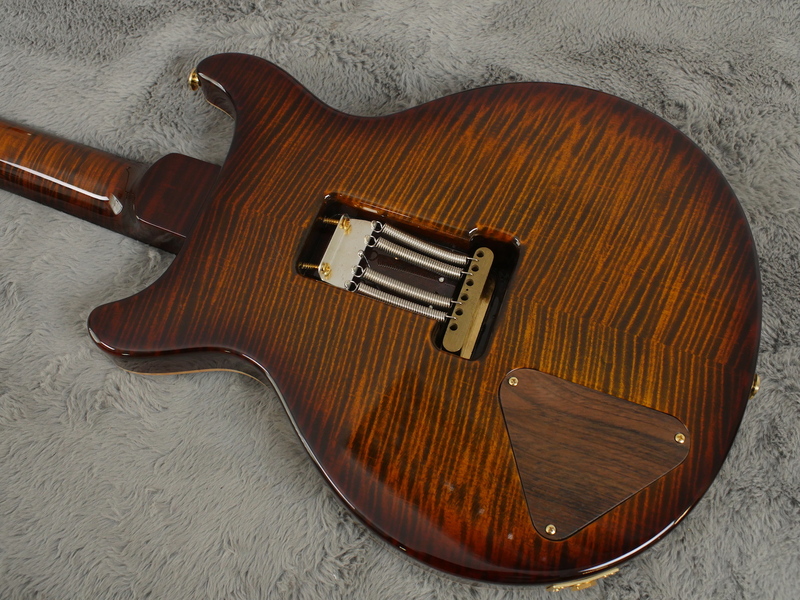 The neck too is AAAA+ figured maple finished, as is the body, in ‘Tiger Eye’ stain with a smoky burst. 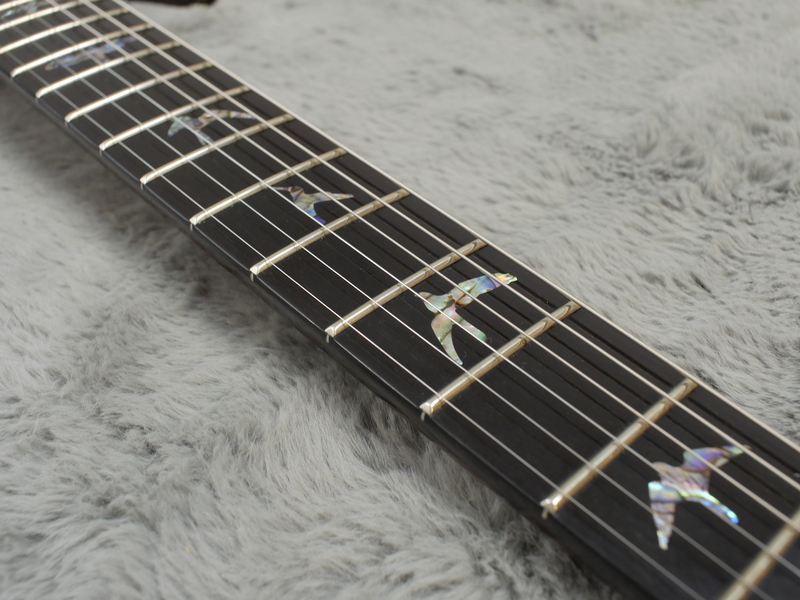 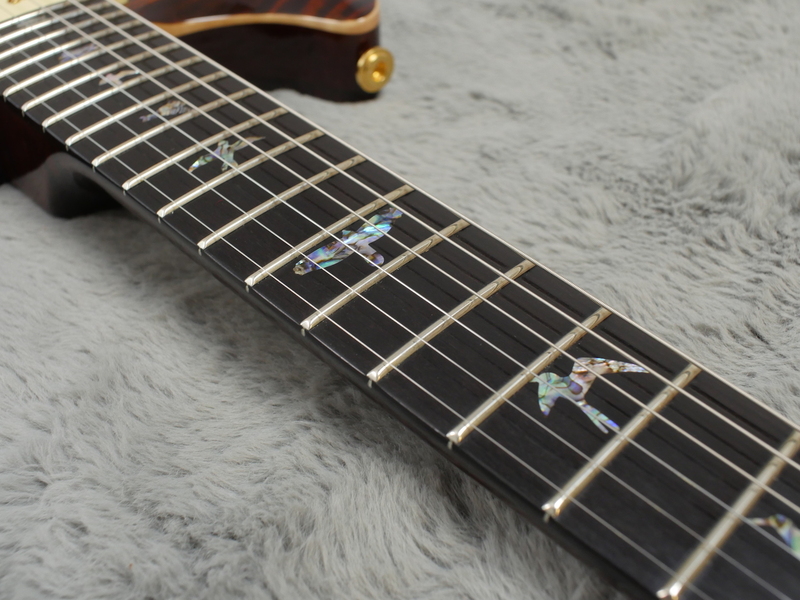 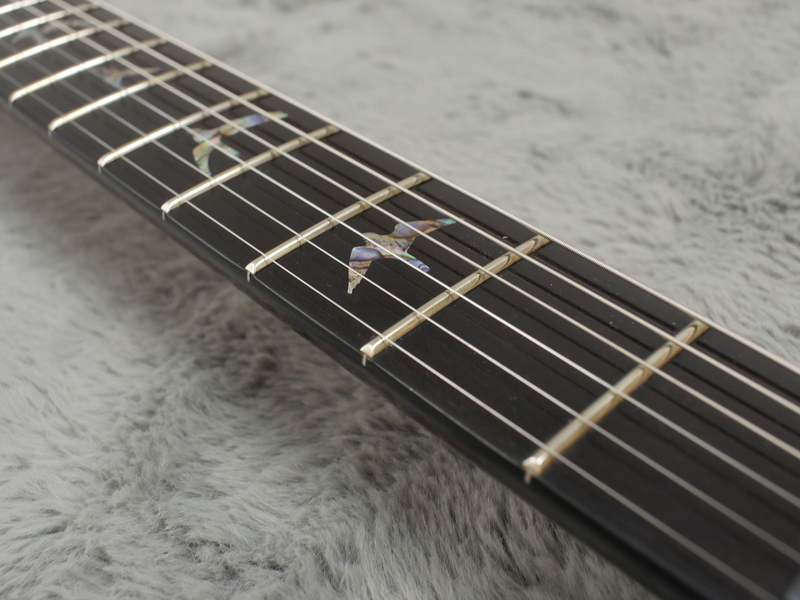 Ebony fingerboard with paua inlays tops it all off. 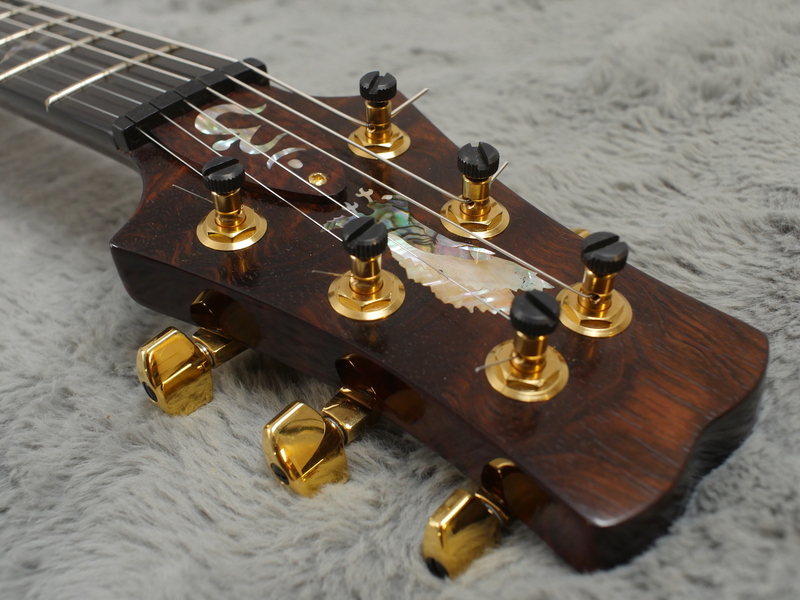 The gold plated hardware and rosewood knobs further enhance the look going to show that Mr Gelston had a good eye for detail. 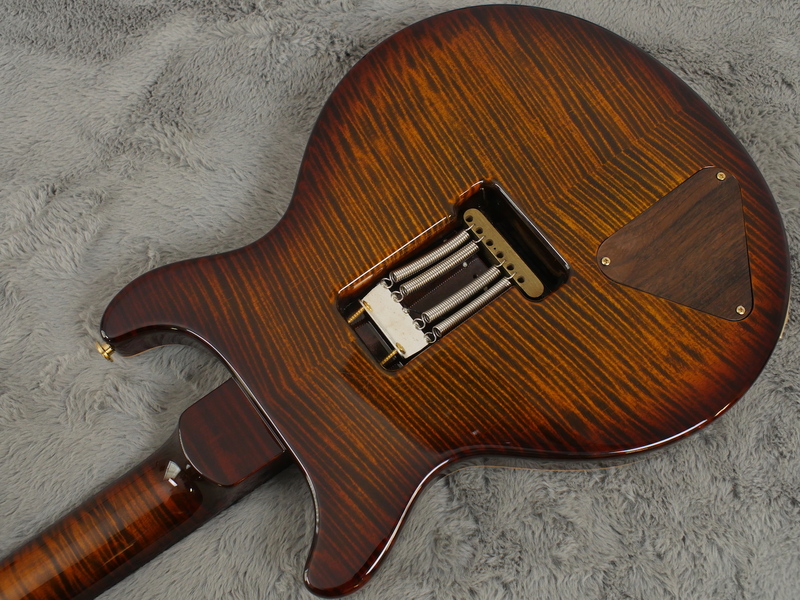 Every employee is offered one of these custom builds having been at the company for 2 or more years, the work being carried out by themselves and members of the Private Stock Department. 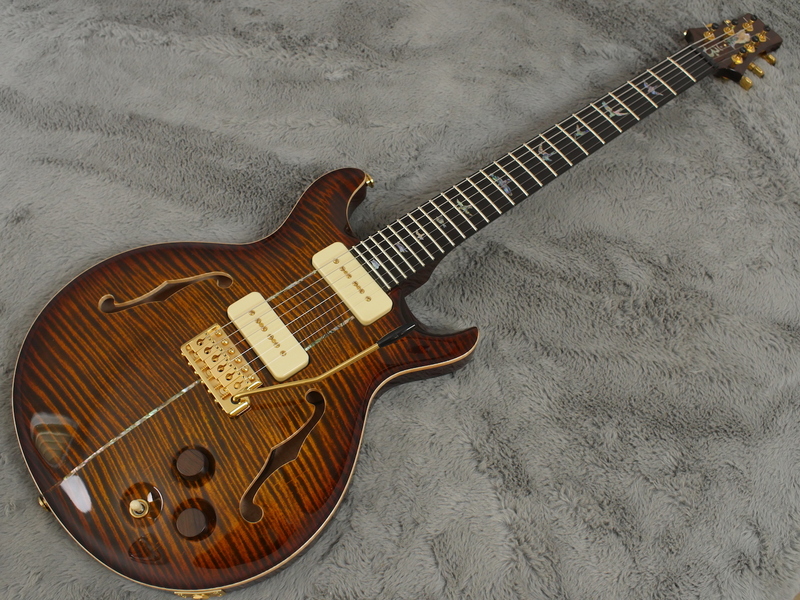 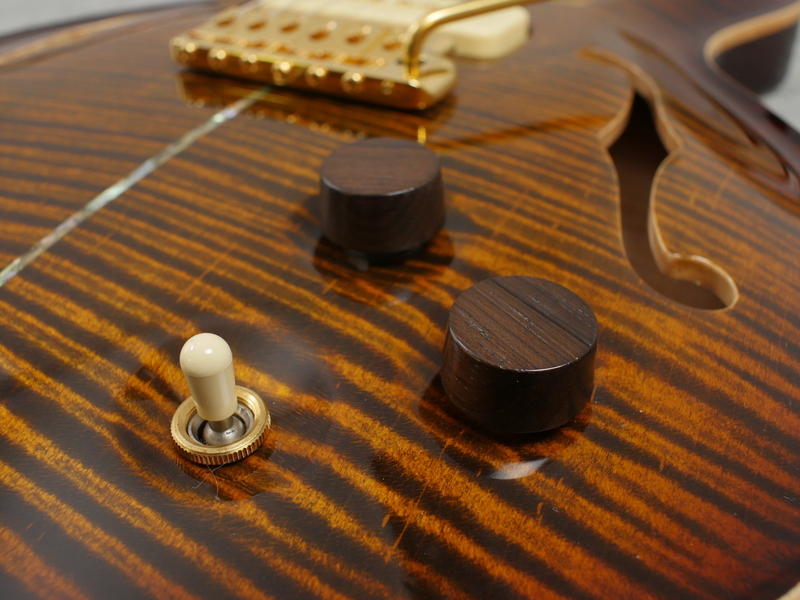 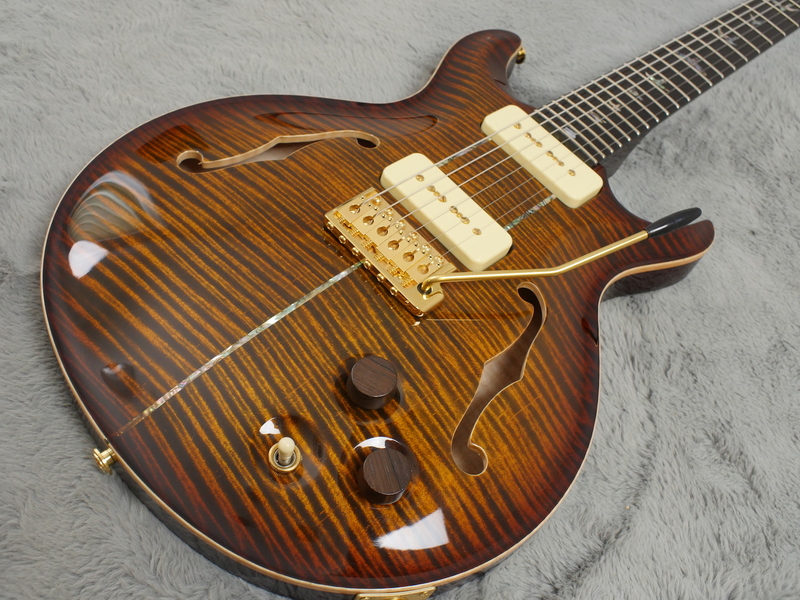 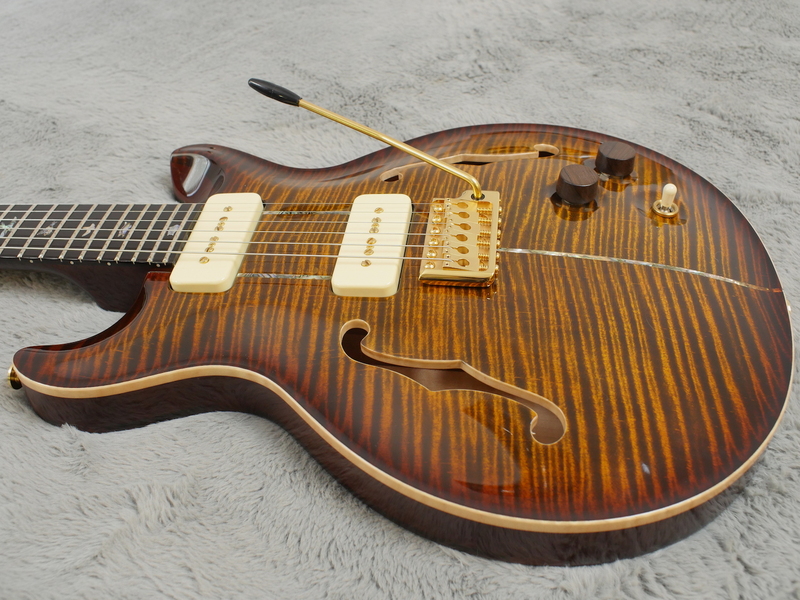 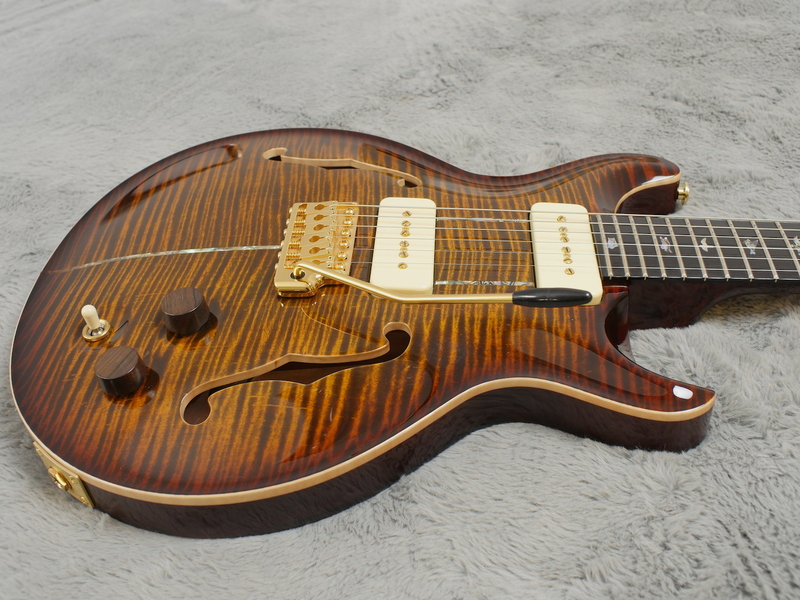 Notably with this guitar, Joe Knaggs was involved in the construction. 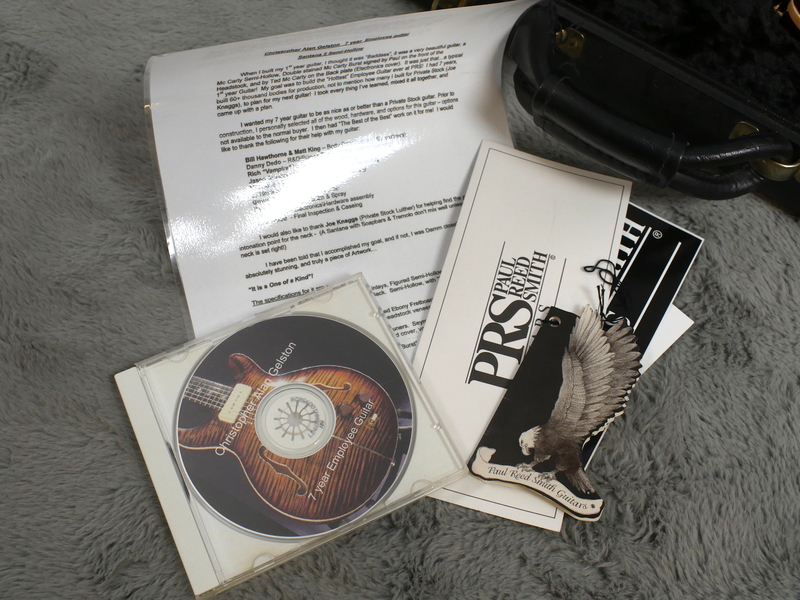 Included with the instrument is documentation from Mr Gelston himself detailing the work and a CD containing pictures of the build process. 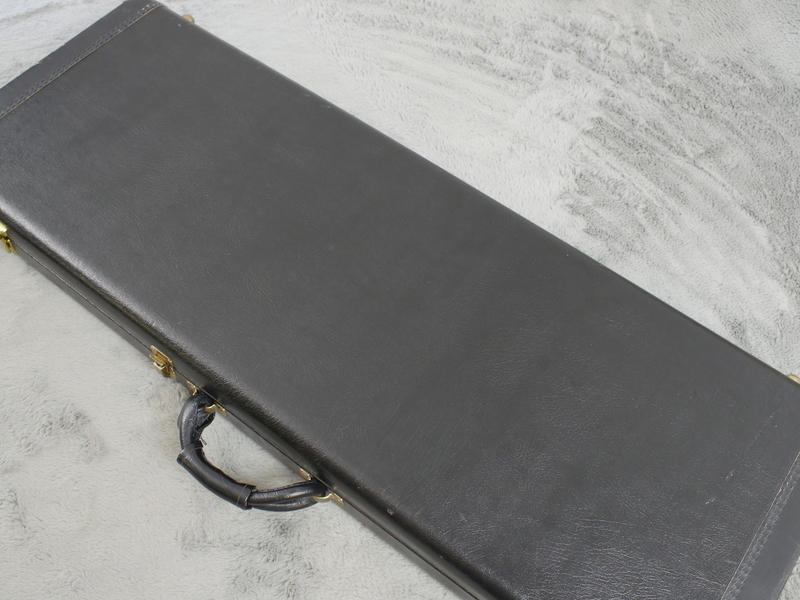 Th guitar comes in a PRS leather hardshell case. 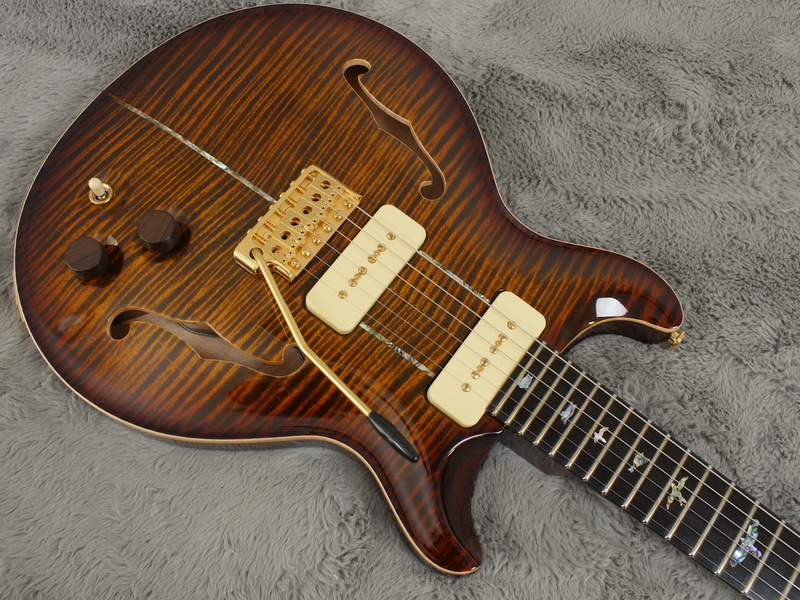 Sonically this guitar has a fantastic tone, the p90s and semi-hollow construction really lending a pleasing bite. 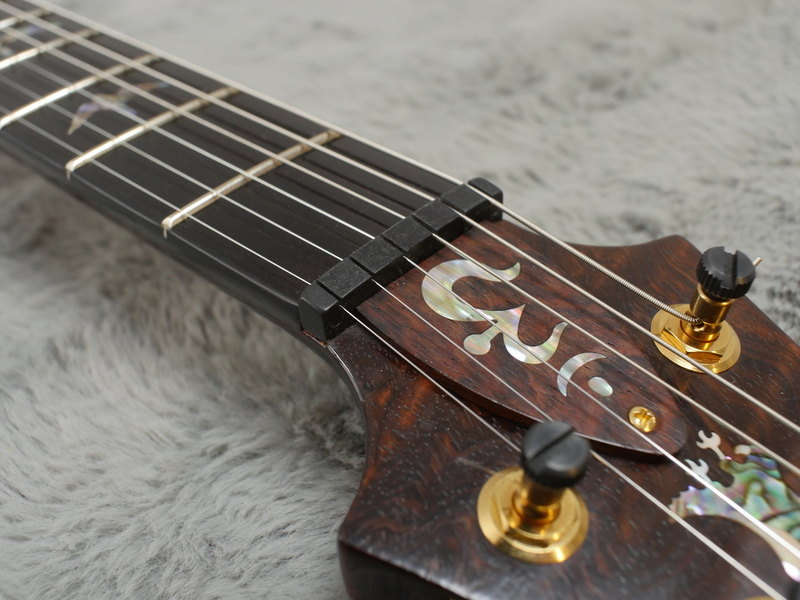 The neck has a soft v carve which is full without being too chunky and comfortable all over. 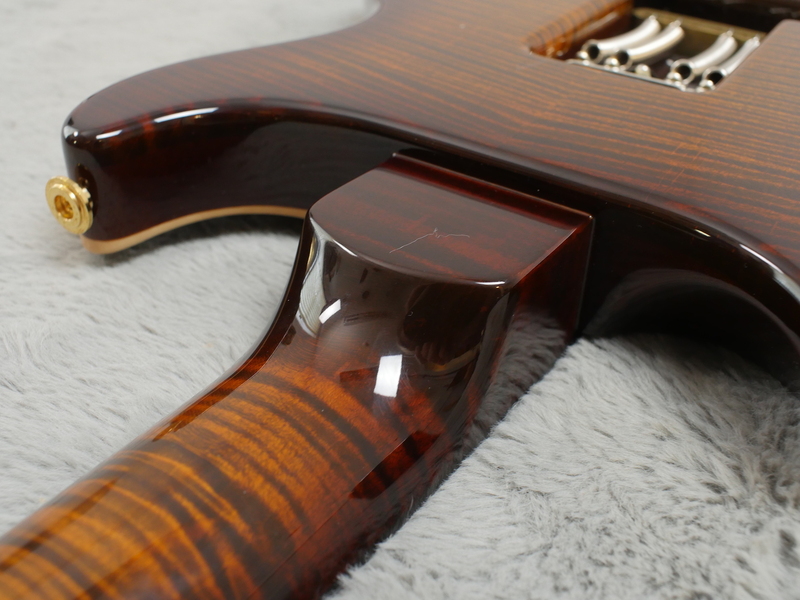 The neck pickup is smooth and clear with plenty of girth without being muddy whilst the bridge isn’t shrill with the biting quality that we are always searching for in that position. 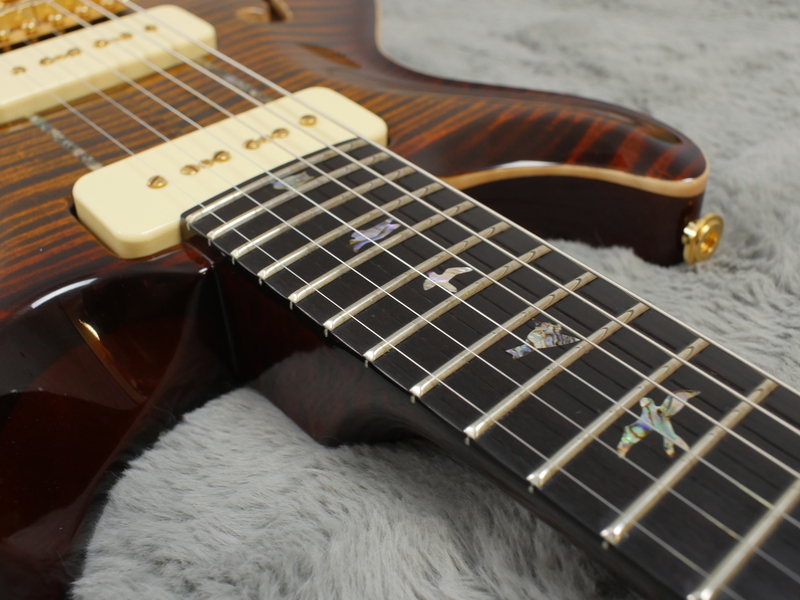 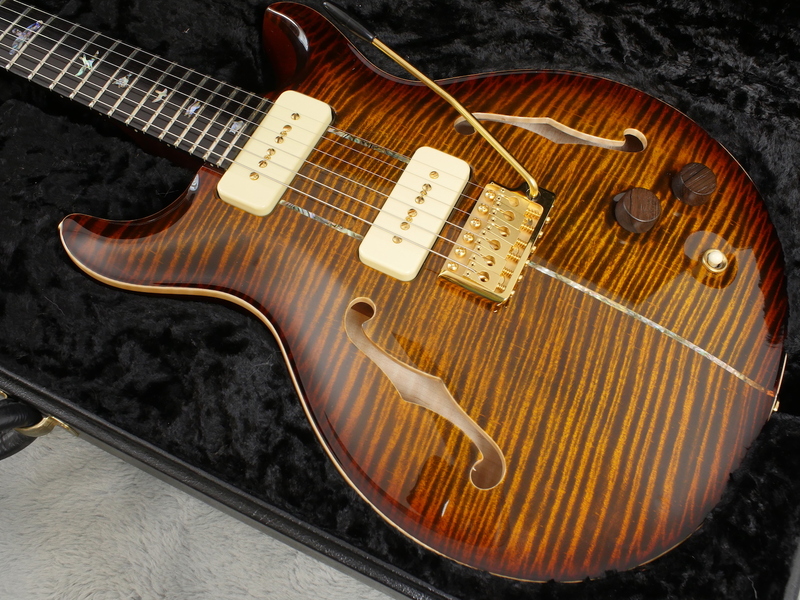 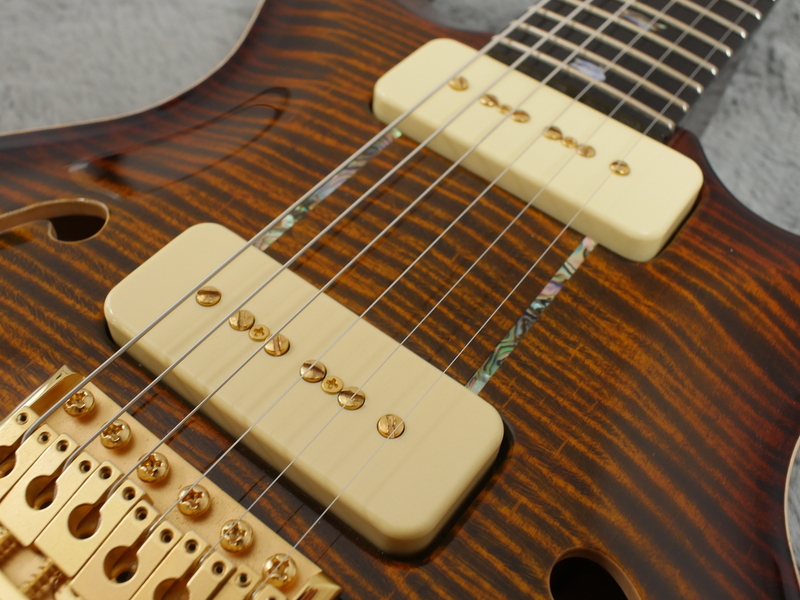 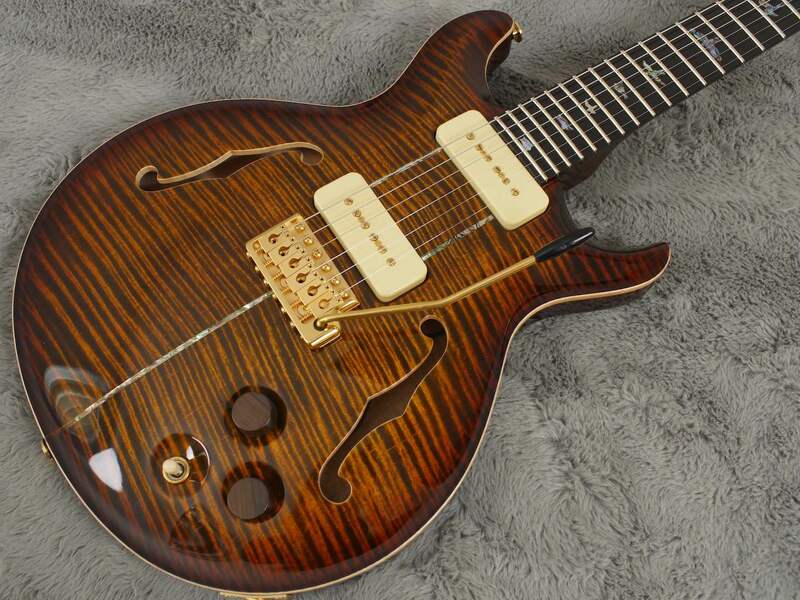 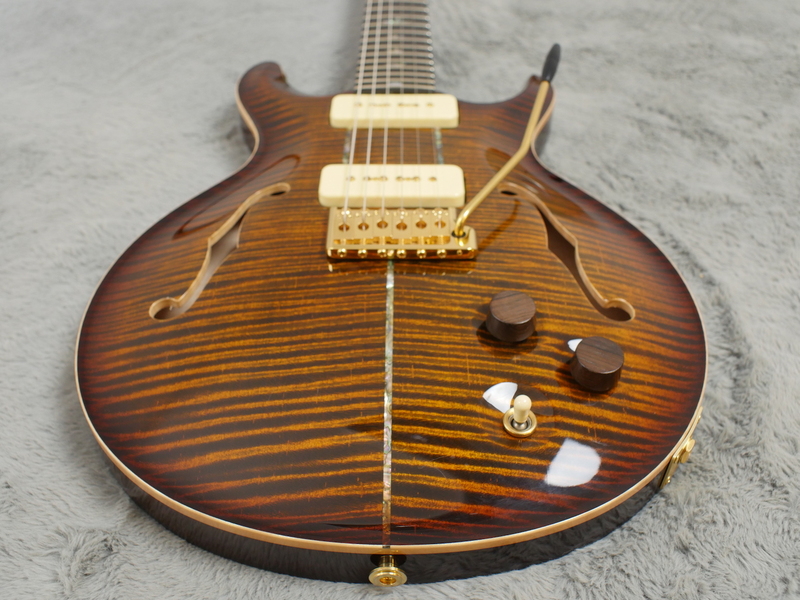 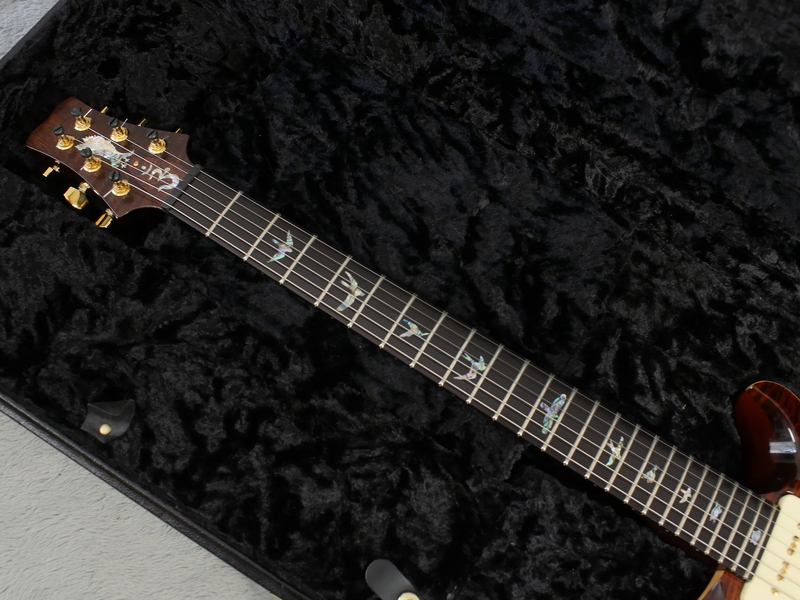 As with all PRS guitars, theres plenty of sustain here and a smooth, effortless playing feel. 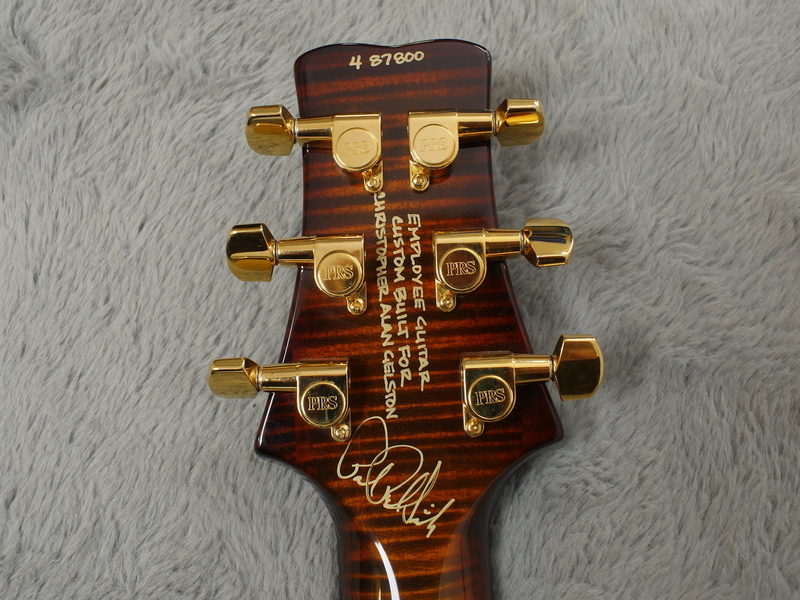 A unique instrument with an interesting angle, these guitars exemplify the passion that the company employees have for their work. 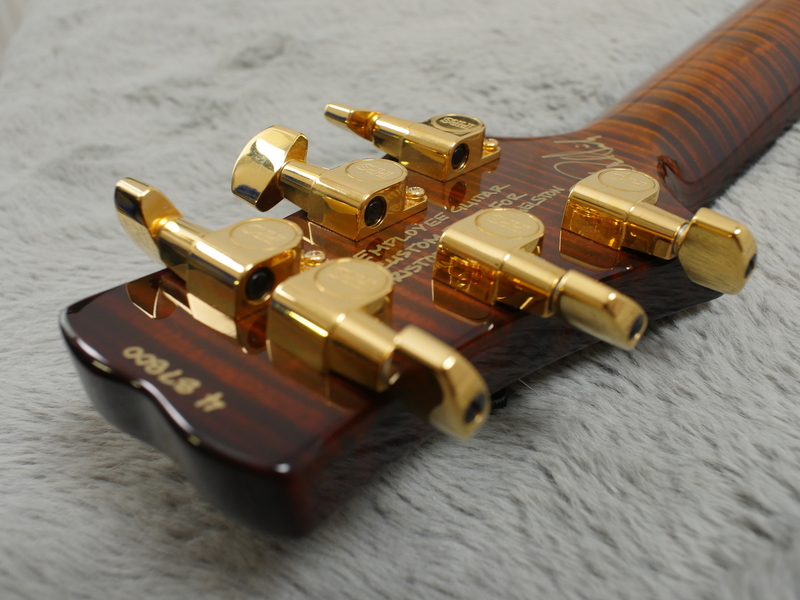 A wonderful piece.